Wednesday: Infighting in the Palestinian Authority continues as abductions and gun battles run rampant throughout the Gaza Strip. Five Palestinians were killed in exchanges of fire between Hamas and Fatah this afternoon throughout northern Gaza. Of those killed four are loyal to Fatah and one is a female bystander who was caught in the crossfire near Jabaliya. Three of the Fatah members killed were officers in the Palestinian Preventive Security Service (PPSS). Close to a dozen additional people were also reported injured in the clashes, though their conditions remain unclear. Sources say that in all, 10 Palestinians have been kidnapped by both Hamas and Fatah. Earlier in the day gunmen, apparently belonging to Hamas, sought out and killed a Fatah operative in Beit Lahiya. Among the abductees are three 17 year old youths, nephews of a senior PPSS officer loyal to Fatah. According to sources in Gaza the teens were apparently kidnapped by members of Hamas. On Wednesday evening Palestinian sources in Gaza reported that a senior al-Aqsa Martyrs Brigade member has escaped an assassination attempt. According to the sources, gunmen fired an RPG toward Hassan al-Qasas and another senior group member. Fatah claims that Hamas is responsible for the attack. Spokesman for Fatah in the Strip, Maher Maqdad, blamed Hamas for killing the officers and said that his movement "will not remain silent in the face of these crimes." However, Maqdad called on the factions to enforce the agreement of calm reached Tuesday and see to it that Hamas, like Fatah, honor it. Ahmed Srur, a resident of the town of Beit Lahiya, told Ynet that the situation in the northern Strip was "very frightening." He said that masked men have deployed across all traffic routes and junctions, questioning passersby and conducting searches. "Wherever you go, you see masked Hamas members. Fatah loyalists cannot be seen on the streets, and Hamas gunmen have taken over things here," he described. Srur said that the residents were very disgruntled with the situation and the fact that no solution is in sight. "We elected a government that would lead to a change in the security situation, but the situation has just been deteriorating. There's hardly any movement in the northern Strip and all people want is to stay inside their homes, so as not to get caught in the fire," he added. Following the shooting of the Fatah member earlier Wednesday morning his family members, along with Fatah gunmen, blocked nearby roads and chanted anti-Hamas slogans. The use of children amidst this infighting is a particularly sensitive subject in the Gaza Strip following the incident in early December in which four Palestinians – including three children – were killed after gunmen opened fire at a civilian vehicle in the Rimal neighborhood in Gaza City. The children, aged 3, 6 and 9, were the sons of senior PA Intelligence officer Baha Balousheh. 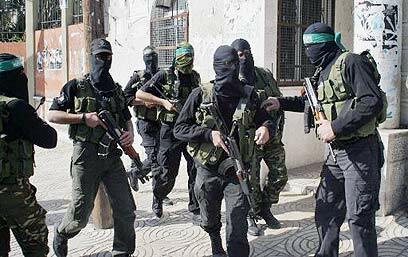 In another incident a Hamas member was injured when a bomb went off in Gaza City. It is estimated that the wounded Palestinian, who serves as Interior Minister Sayeed Siyam’s body guard, sustained the injury while preparing the bomb. A Hamas member was killed Tuesday under similar circumstances. See all talkbacks "Gaza infighting: 5 killed, 10 kidnapped"